Wing span: 3 1/2 - 5 inches (9 - 12.7 cm). Identification: Upper surface of male forewing with narrow black stripes. Each hindwing has 2 tails. Life history: Males patrol stream courses or city streets for receptive females. Eggs are laid singly on leaves of host plant. Caterpillars eat leaves and rest on silken mats in shelters of curled leaves. Chrysalids hibernate. Flight: One flight May to mid-August in North, most of year in South. 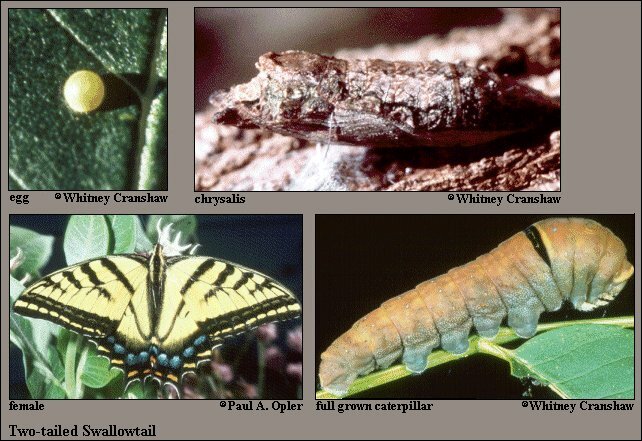 Caterpillar hosts: Leaves of ash (Fraxinus), hop tree (Ptelea), and chokecherry (Prunus). Adult food: Nectar from thistles, milkweeds, California buckeye, lilac, and many others. Habitat: Foothill slopes and canyons, moist valleys, streamsides, woodlands, parks, roadsides, suburbs, and cities. Range: Western North America south from British Columbia, east to central Nebraska and central Texas, south through Mexico.